New World Academy is an alternative learning platform for art and politics established by artist Jonas Staal and BAK. Developed together with the Kurdish Women’s Movement as a nomadic platform that unfolding throughout 2015, the fifth sequence of the New World Academy explores—from artistic, activist, and scholarly perspectives—the proposition of delinking democracy from the nation-state: the notion of “stateless democracy.” On this occasion, the fifth reader of the New World Academy, titled Stateless Democracy, has been published. If initially the Kurdish struggle, led by the Kurdistan Workers’ Party (PKK), had aimed to establish an independent state, since the 1990s PKK leader Abdullah Öcalan, together with the Kurdish Women’s Movement, have turned to questioning the patriarchal and capitalist nature of the very concept of the nation-state itself. Within this process the Kurdish revolutionary movement developed an alternative model called “democratic confederalism” or “stateless democracy” that invoked a confederate composition in which gender-equality, self-governance, secularism, cultural diversity, communal economy, and social ecology form key pillars. Since 2012 this proposition has been put fully into practice in Rojava, Western Kurdistan in Syria, in alliance with the peoples of the region. 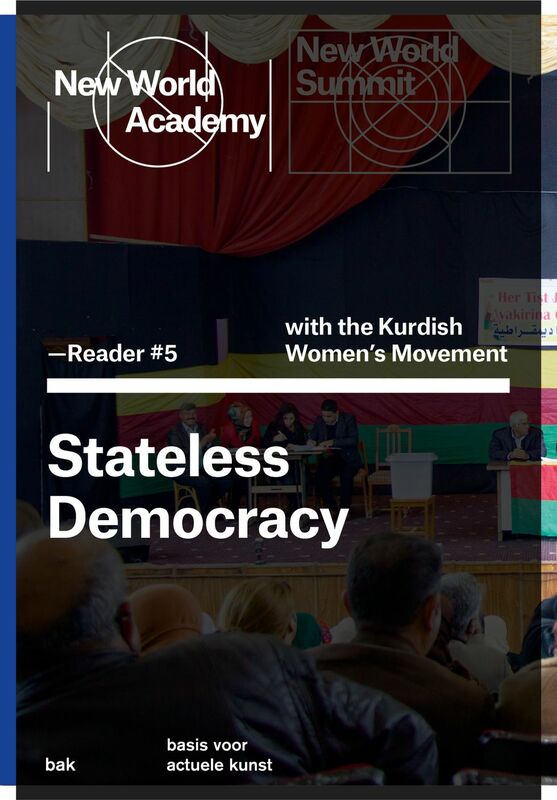 New World Academy Reader #5: _Stateless Democracy _provides key texts that offer an overview of both the political and cultural dimensions comprising what has now come to be known to history as the Rojava Revolution. The texts in the reader are as much an introduction to the model of stateless democracy practiced in Rojava, as a potential political paradigm through which to confront the many related crises in politics, economy, and ecology that we face across the world. With contributions by: Kajal Ahmed (poet and journalist), Ahmet Hamdi Akkaya (political and social scientist), Janet Biehl (writer, editor, and graphic artist), Murray Bookchin (libertarian socialist author), Dilar Dirik (researcher and representative of the Kurdish Women’s Movement), Zîlan Diyar(Kurdish guerrilla fighter), David Graeber (anthropologist), Havin Güneşer (journalist and spokesperson of “Freedom for Abdullah Öcalan – Peace in Kurdistan”), Joost Jongerden(sociologist and anthropologist), Gönül Kaya (journalist and representative of the Kurdish Women’s Movement), Abdullah Öcalan (founder and leader of the Kurdistan Workers’ Party (PKK)), Pinar Öğünç (journalist), Jonas Staal (artist and writer), and Hito Steyerl (artist, documentary filmmaker, and writer). Edited by Renée In der Maur and Jonas Staal in dialogue with the Kurdish Women’s Movement (and in particular Dilar Dirik, Kurdish activist and a PhD student at the University of Cambridge, Cambridge) this fifth reader examines the itineraries of the Kurdish Women’s Movement—an umbrella organization that has been foundational in shaping the political objectives of the Kurdish liberation movement internationally. Realization of this publication has been made possible by financial support from the DOEN Foundation, Amsterdam and the Creative Europe Programma of the European Union. For inquiries or to order a copy of this publication, please send an e-mail to [email protected]. Click here to view the reader online.